U. Zimmerman and G. Neil ed. This book covers the impact of electric field effects of high and moderate intensity on cell and artificial membranes as well as the "electric structure" of the cell. 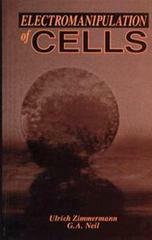 The principles are illustrated by widely used techniques of mammalian and human cell fusion, electropermeabilization of various cell types, and advanced cellular electromanipulation. Where relevant, key historical references are discussed to put the field in proper perspective. Inclusive reference list for each chapter available for the investigator requiring an in-depth treatment of specific topics.